­­­­­­­­­­­­­­­­Can PhotoMed’s algorithm help your patients with previously untreatable pain? In 2 out of 3 cases, this therapy doesn’t work either. But 1 in 3 do improve. As nerdy engineers, we don’t have a clue why. Neither do our advisory anesthesiologists and neurologists. Neuroplasticity? Quantum entanglement? When the therapy fails to benefit, besides disappointment, there are no side effects. Your chances for ending the non-responsive pain may not appear good statistically. But at least you and your patient won’t have to wait long to find out if you got lucky. Did PhotoMed Technologies invent light therapy? No. The PhotoMed team of engineers, anesthesiologists, and neurologists did not invent the basic visible light therapy. Let’s just say that people have recognized light as an agent for healing for a long, long time. As technologies advanced, so did the study of the effects of visible light. Edwin Babbitt published his tome about light and color in 1878. About that time, Danish Dr. Finsen researched the curative properties of different wavelengths for different disorders. He found a couple of wavelengths that worked well on different disorders. For this, he received the Nobel Prize for Medicine in 1903. Dr. Finsen also found that no single wavelength worked for every disorder, just like medications. The most interesting wavelengths were blue and red. The other wavelengths were not as highly researched. Finsen lacked the tools for testing each wavelength for what it might accomplish. Photo Med’s team of nerdy engineers thought that access to all visible wavelengths might improve the practitioner’s batting average. The team invented an efficient algorithm that uses feedback for selecting different visible wavelengths that might prompt relief. PhotoMed’s Vari-Chrome® Pro includes five pre-programmed selections that simplify its operation. Each selection varies the wavelength during therapy through a continuous range of visible wavelengths. Dr. Finsen was right all along. Why didn’t someone build the tools that Finsen would have needed? What if it takes two wavelengths or a sequence of wavelengths to relieve unresponsive pain? In despair, PhotoMed’s team invented the Instant Feedback System™ to record the effects of different wavelengths in the same person during each visit. The System recorded physiological responses when the body resumed its normal functions. What do some recordings show? 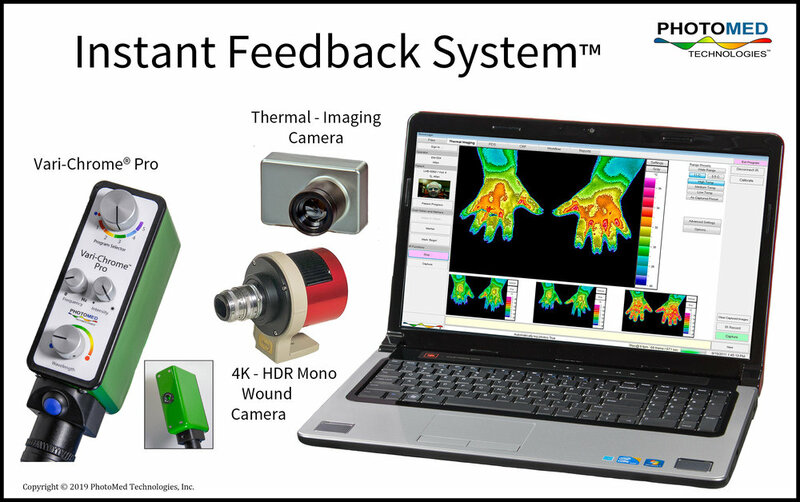 For people with abnormally cold hands or feet, thermal imaging provides feedback to the operator for adjusting the therapy. Recordings let everyone observe previously unseen events. Click the image to play the recording. Note that the light stimulation was applied to three different locations around the head & neck but not to the hands. Wouldn’t Einstein call this “spooky action at a distance”? How long can a disorder remain yet end while you watch? For 30 years, Robert suffered coldness discomfort. He had this since he was a teenager. His co-workers complained when he turned the heat up in the summer. Robert’s hands warmed over a 10-minute period after a single stimulation about his neck. Robert’s hands remained comfortable for more than a year in the absence of therapy. What other functions returned to normal? PhotoMed’s Instant Feedback System™ began with a singular purpose; to find disorders that might respond to PhotoMed’s algorithm. The methods were superficially simple. The team sponsored studies that invited volunteers with disorders which were not expected to improve. Also included were people with multiple sites of pain and disorder. The impairments from the disorders ranged from mild to horrible. Improvement of abnormal skin temperatures was easy to document using thermal imaging. The Instant Feedback System™ could continuously take the images. PhotoMed’s recordings may be the first of their kind, but the events are not new to patients recieving non-invasive therapies. Click here for a partial list of disorders that have responded to PhotoMed’s algorithm.